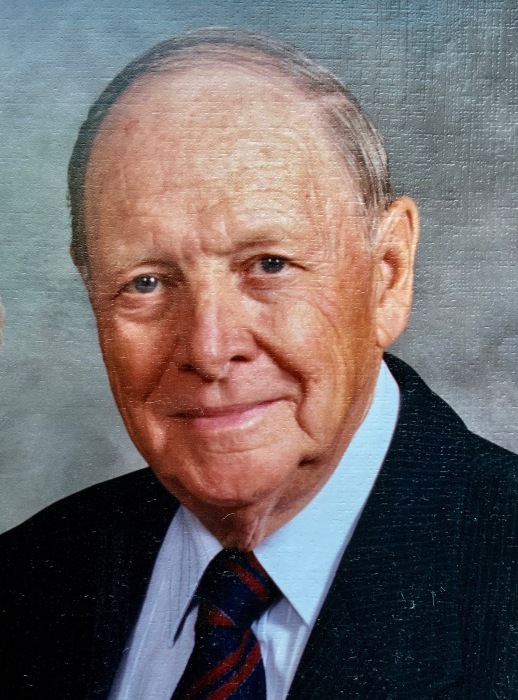 It is with deep sorrow that the family of Ronald Hamre, age 92, announces his passing on Friday, March 29, 2019 at the Meadows, Swift Current, SK. Ronald Clare Hamre was born on December 28, 1926 in Hanley, SK — the third son of Tandrup & Marie Hamre. Ron married Wynona Adams on August 4, 1949 and they lived in Kenaston, SK and Swift Current. Ron spent much of his early working career working in his parent’s Red and White Store in Kenaston. Ron held a Journeyman Electrician Certificate and was involved with rural electrification around Kenaston. He also operated a TV and radio repair business. Ron was very involved in the community, serving on the Kenaston School Board for many years, and for nine years on the Davidson School Unit board — two of those as the Chair. Ron was a Boy Scout Leader for many years and was proud to help several young men become Queen Scouts. He was a Mason and member of the Order of the Eastern Star, and was a past Master of both. In 1969, Ron went to University and he was awarded a Bachelor of Education with Distinction in 1975. He and the family moved to Swift Current in 1971 and Ron taught Electronics, Electricity, Machine Shop, and Math at the Swift Current Comprehensive High School. He also established a Photography Club and a Ham Radio Club at the high school. Ron retired from teaching in 1990 and was able to spend more time pursuing his hobbies — Big Band music, amateur radio, camping, photography, gardening, stained glass, and model boat building. Special thanks to the caregivers at the Meadows for many years of excellent care provided to Ron. Ronald was predeceased by his parents, Tandrup & Marie Hamre; his brother and sister-in-law, Glenn and Dorothy Hamre; his sister-in-law, Muriel Hamre; and by his brother-in-law, Jim Adams. Ron will be lovingly remembered by his wife of 69 years, Wynona Hamre (nee Adams); his children, Kathryn (Evanna Simpson) Hamre (Regina, SK), Nancy Kirk (Climax, SK), Lyle (Chris) Hamre (Fredericton, NB), and Alynne Hamre (Swift Current, SK); his grandchildren, Blair (Stacy) Wasmann, Jori (Emma) Kirk, Logan (Kayla) Kirk, Rhett Kirk, Kate Hamre, and Spencer Hamre; his great-grandchildren, Elizabeth and Aidan Wasmann, and Jaxon and Cooper Kirk; his brothers, Vance Hamre and Keith (Ethel) Hamre; and by many nieces and nephews. The Funeral Service for Ronald Hamre was held on Wednesday, April 3, 2019 at 2:00 pm from the Swift Current Funeral Home Chapel, Swift Current, SK with Rev. Eleanor Rockabar officiating. “Just a Closer Walk with Thee” was sung by the congregation, with Mary Henderson serving as song leader and pianist. The eulogy was given by Jori Kirk. Ronald’s grandchildren, Blair Wasmann, Jori Kirk, Logan Kirk, Rhett Kirk, Kate Hamre, and Spencer Hamre served as Honorary Pallbearers. A Private Interment Service will be held at a later date. In lieu of flowers and in memory of Ronald Hamre, donations made to the Alzheimer’s Society and the Meadows Auxiliary would be appreciated by the family.